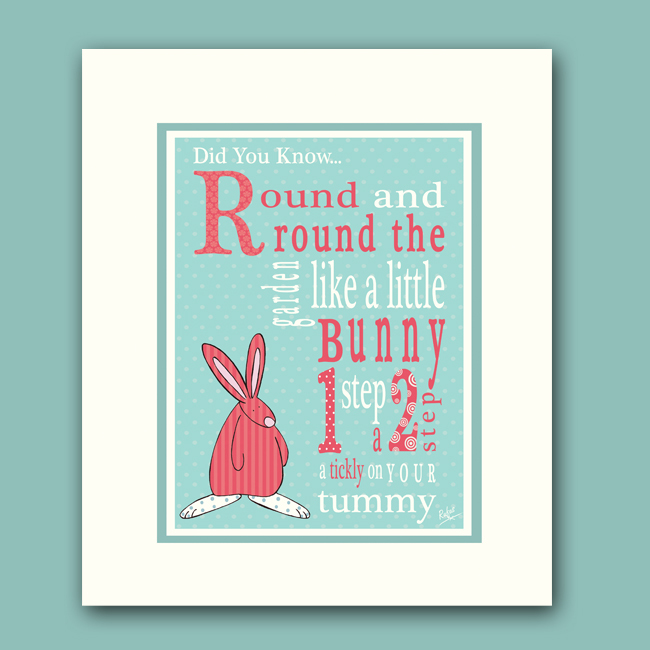 Round The Garden Children’s Art Print by Rufus Rabbit. Did you know... Round and round the garden, like a little bunny. 1 step a 2 step and tickly on your tummy. Rufus Rabbit has created some prints for children’s rooms inspired by nursery rhymes and parental and little one’s twitterings!. This Round the Garden children’s art print is from a limited print run of 100. This print will add a splash of affordable Rufus colour to your child’s bedroom, nursery or playroom. Printed on a quality textured paper, the twinkle art print will arrive with you backed on a sturdy board, in a cello wrapped bag. Framed size 25.5cm x 30.5 or to fit a 10″ x 12″. Whilst you are here, please do feel free to enjoy Rufus’ funny bunny blogs Screaming Banshee Or Mum On The School Run?